Warning: this page contains a picture that may be distressing for some persons. 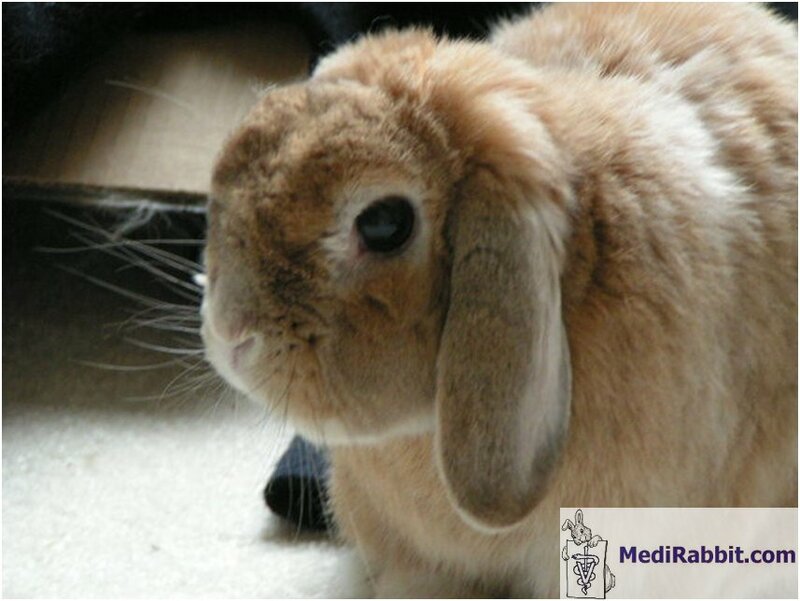 Rabbits are easily stressed, and administration of a medicine or a test for diagnosing a disease, e.g. taking a blood sample from the ear, can become a challenge. proper restraint is thus of utmost importance. 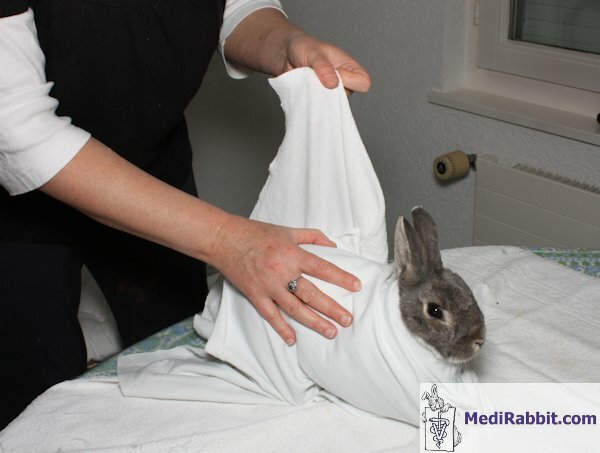 Restraint of a rabbit in a towel, a drape, or a shirt, must be done with calm movements and carefully. It is important to wrap the used material tightly around the body, but lose enough to avoid compression of the abdomen, and allow normal respiration. 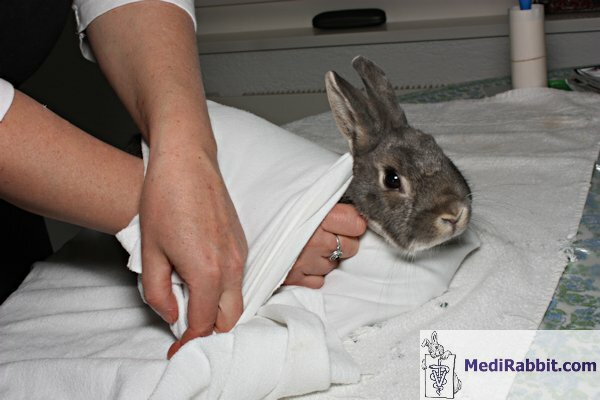 Once wrapped safely in a towel, most rabbits feel secure and will not attempt to squirm out or struggle to escape. 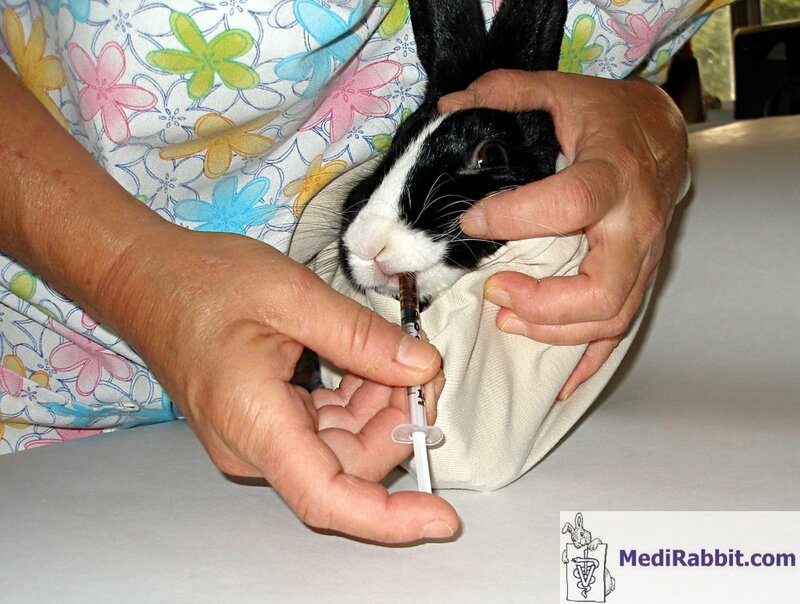 As a rule, the rabbit should NEVER be left without surveillance on the examination table !!! The burrito technique requires some practice, before using it generally. 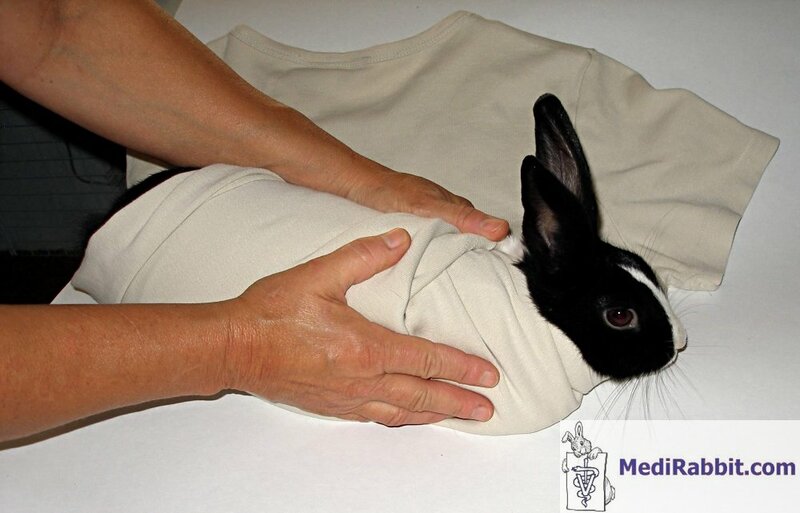 If the rabbit is calm, the rabbit burrito can be done on the examination table. With a nervous or aggressive rabbit, or more generally, it is done safest to do this procedure on the floor. 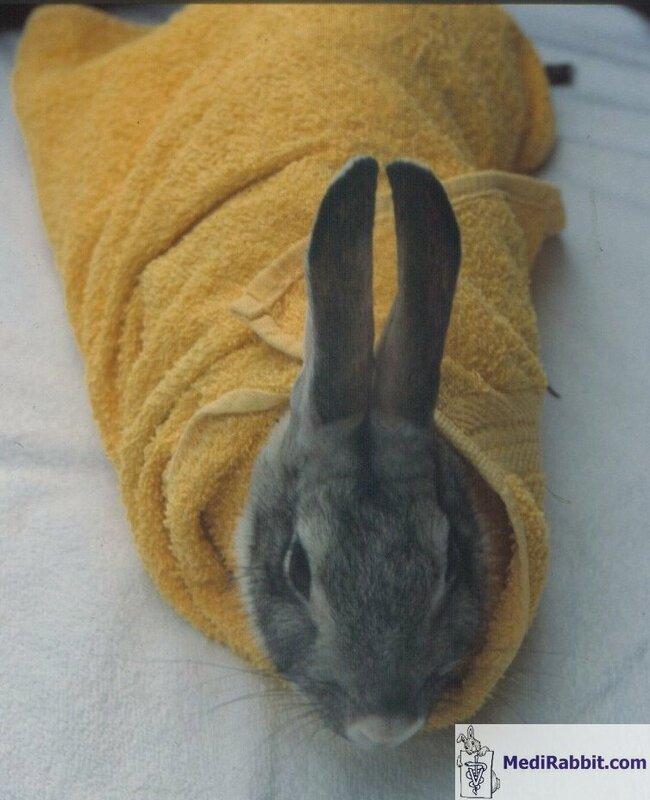 Indeed, when a rabbit is poorly wrapped in a towel or other cloth material, it may try to free itself in order to escape. The consequences can be devastating, e.g. limb fracture, muscle damage or spine luxation, and even fatal. 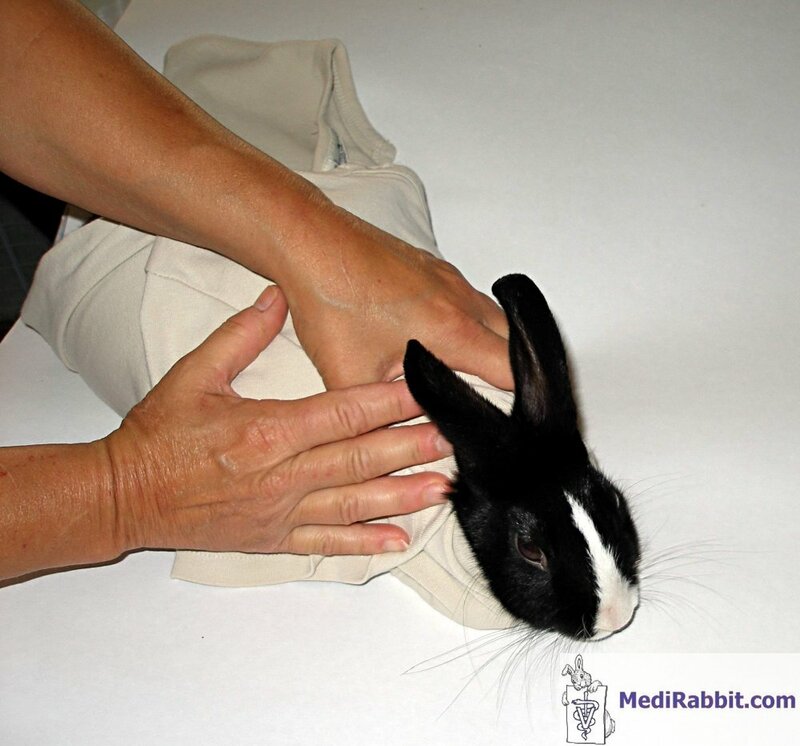 The method of rabbit restraint using the burrito method is very individual. General important point should nevertheless be taken into account to avoid panic and attempts of escape. They are illustrated in the following pictures. 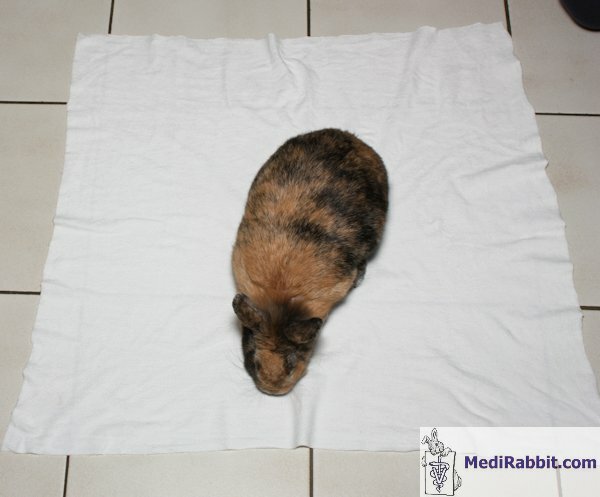 After putting the towel, drape or T-shirt on a flat surface or table, the rabbit is placed on the middle. 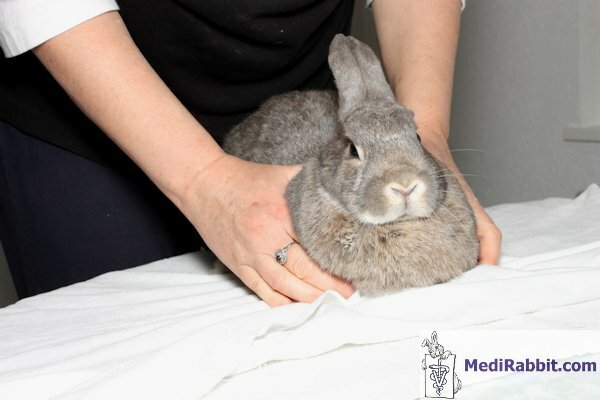 Holding the rabbit by placing one hand on the scruff of the neck and the second over the hip region, or by placing both hands on the shoulders calms it and helps prevent escape. The rabbit is placed on the cloth material, in a chicken position. The person standing in the back of the rabbit will prevent a fall to the ground if the rabbit makes a backward movement or escape. 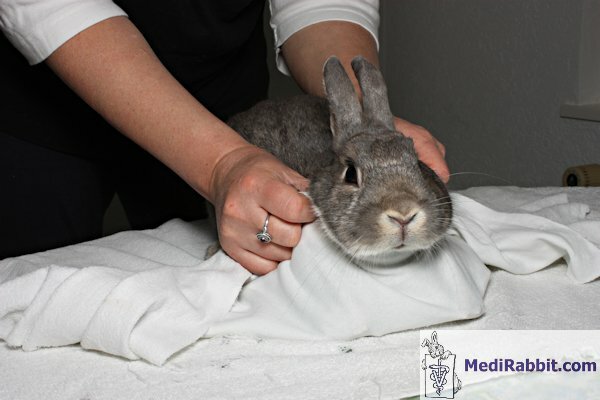 The towel iswrapped closely around the base of neck of the rabbit to ensure full restraint of the front limbs. The side flaps of the cloth are then brought back to the level of shoulders of the rabbit, one after the other, tightly encircling the dewlap and chest regions. 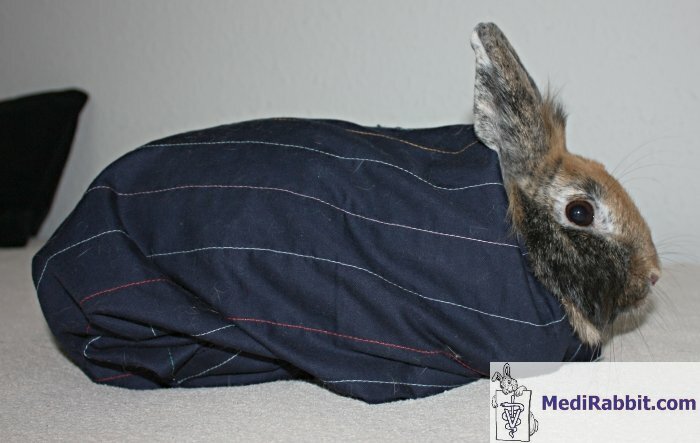 One side of the towel is flapped tightly around the rabbit and is tucked under the abdomen of the rabbit, without compression of the chest and lungs. 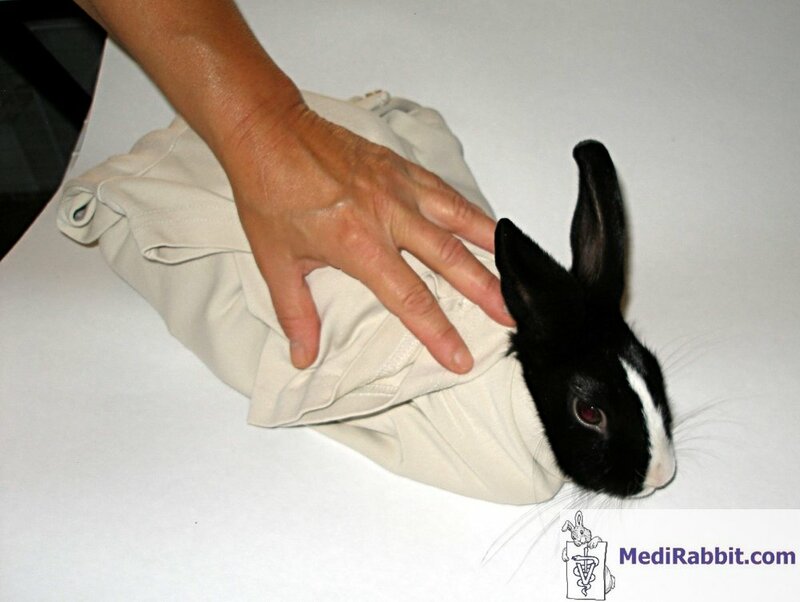 The other side of the towel is flapped tightly around the rabbit and is also tucked under the abdomen. the remaining flap is brought forward to prevent a backward escape. While one hand (here right hand) holds the flap tucked under the abdomen in place, the second hand (here left hand) keeps an upward pressure on the free end of the towel so that it can be wrapped closely around the neck. The second side of the towel is now flapped back over the rabbit. A hand placed firmly over the shoulders, or around the shoulders and posterior limbs, will calm the rabbit stop. Hands can also be placed over the eyes. When done properly, only the head and ears are showing at this stage. The rabbit usually remains very calm. Finally, the part of the towel at the back end of the rabbit is brought back over or under the body of the rabbit. This avoid attempts of kicking and injuring the posterior limbs, or escape by backing out of the towel. At the end of the wrapping procedure, a hand is posed on the shoulders of the rabbit. 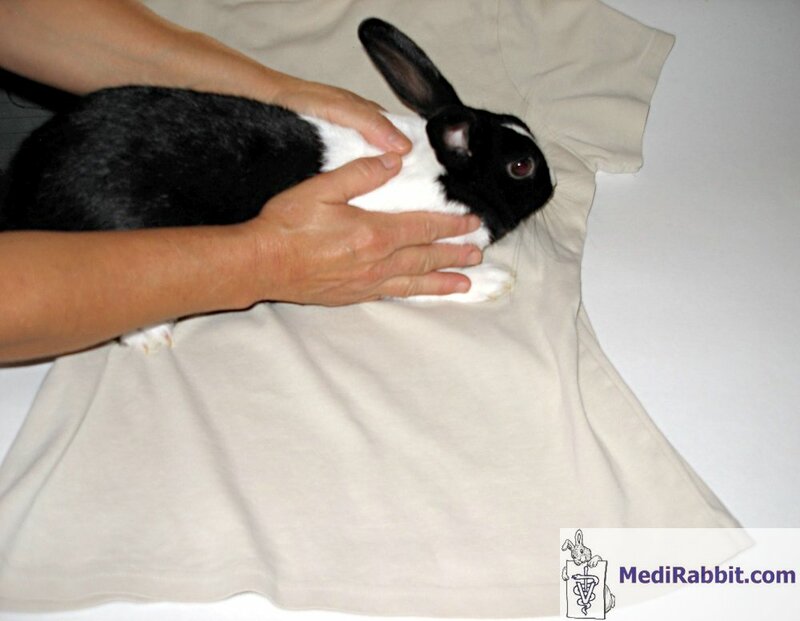 While this help control attempts to losen the towel and escape, it also calms the rabbit imprisoned in the towel or shirt. 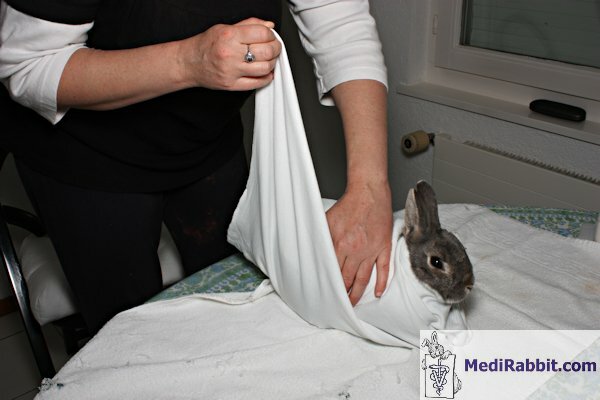 The use of a restraint bag adapted to the size of the rabbi is further safe solution to immobilize a rabbit. These can be purchased in specialized shops, or custom made to the rabbit. 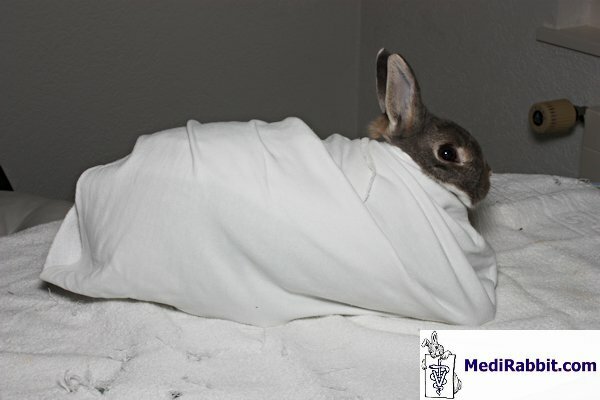 A special thanks to Kim Chilson and sick Chase for their help and demonstration of the "rabbit burrito" method. 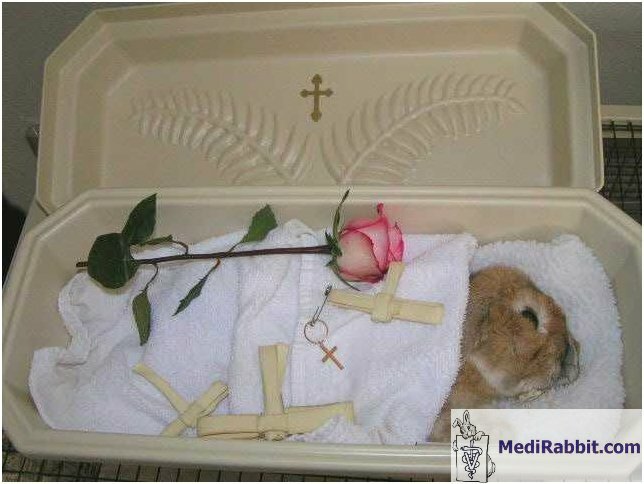 A special thanks also to Wendy and the pictures of her beloved rabbit BunBunBoy. Thank to Grisjje and Yara for their cooperation.